CYTRAK Orange™ is a novel orange fluorescent dye related to DRAQ5™ that stains both nucleus and cytoplasm. It is water soluble and membrane permeant and can be used in LIVE cells in combination with other common fluors, especially GFP fusions, FITC-labelled antibodies and far-red dyes. CyTRAK Orange™ is available in three sizes; 50μl, 200μl and 1ml. You can order CyTRAK Orange™ directly from the website. CyTRAK Orange™ can be used as a LIVE or fixed cell counterstain or as a cell location dye to define the perimeter of the cell in a variety of cell-based assays. It can be excited at 488nm and 534nm with optimal emission at 615nm. It can be used in flow cytometry to separate (gate) nucleated cells without the time-consuming and potentially damaging RBC lysis procedures. 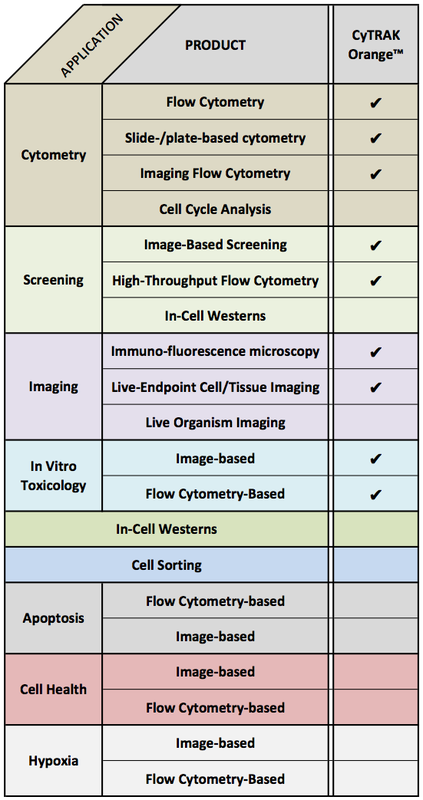 It is highly compatible with existing protocols and proven across a wide range of instrumentation platforms: flow cytometers, epifluorescence and confocal microscopes and image-based HCS platforms. CyTRAK Orange™ co-excites at 488 nm with eGFP, FITC and Cy2 flurophores avoiding the need for laser alignment in confocal instruments when this combination is used. CyTRAK Orange™ has an emission profile that permits the simultaneous acquisition of commonly used "green" fluorphore signals (e.g. eGFP, FITC and Cy2) AND far-red FRET dyes (e.g. PE- and APC- Cy7) combined with discrimination of both the nuclear and cytoplasmic compartments. A separate series of parameters can be detected with red-exciting fluorphores such as APC, APC-Cy7 since CyTRAK Orange™ is not excited at 633 or 647 nm.